After 2 hours, punch down the dough and divide into four pieces. Dip your fingers into the bowl of water and press into the dough with all fingers, making little bumps and indentations on the surface. Starting at the top, work your way downwards, dipping your fingers into the water often, and repeating to press into the dough until you have an oval of fairly even thickness that is about 4 inches in width and 6-7 inches in length. Sprinkle the surface with sesame seeds. Pick up the naan, draping it over the sides of both hands. Now continue to shape it by stretching it with your hands until the naan is about 10-12 inches in length. In a preheated, 475-degree oven into which you've placed a pizza stone of unglazed tiles, place the naans, one at a time, directly on the hot tiles. Be very careful not to burn yourself. Fit as many naans as will go on the tiles without overlapping. Bake about 6-7 minutes or until the top and bottom are a pale gold-brown. 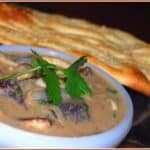 Remove with tongs and serve hot with mushroom korma (recipe follows) or any spicy curry.